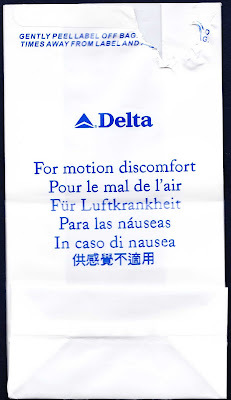 I was also a bit put off that Delta thinks that, as an American, you are going to get upset or distressed if they call it a Puke Bag. Or Vomit Bag. 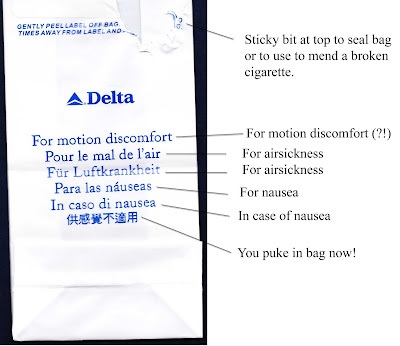 Or even just an Air Sickness Bag. They call it a Motion Discomfort Bag. The bag has two sides and those clever Marketing folks over at Delta thought you could use the bag to save your seat so they printed Occupied on the bag. Me? I kill two birds with one stone and puke in my seat. That way nobody is going to take my seat and I don't have to own up to being a little girl. That does not say, "you puke in bag now"
Yes I know. 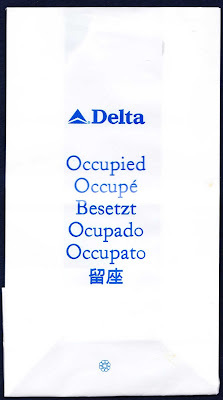 It actually translates to, "In Bag, you puke now." Sorry for the slip up! Sharpies wouldn't work on this?